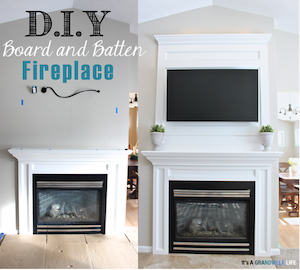 If you missed my post from Tuesday, I finally shared the reveal of our newly painted kitchen cabinets (you can catch up here)!! Now that cabinet painting project is finished, that means that we can continue on with the other projects in this space! 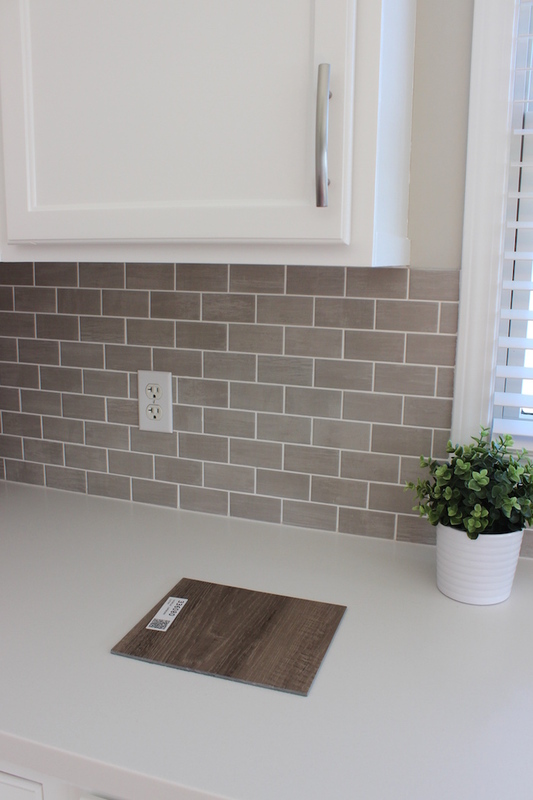 We could easily stop here with this kitchen project, but there are only two more aspects that I'm very excited to be changing that I think will really complete the look of this space! Want to know what those two things are, then keep reading! First up, the floor!! Now that the cabinets don't match the flooring anymore, it doesn't look nearly as bad but the flooring is 10 year old builder grade laminate that isn't in the best condition so it's all going. Plus with the white cabinets and very light gray countertops, things are looking very light so I want to add some much needed warmth to the space. If you have been following me for awhile, this isn't the first time that you have heard me talking about wanting warmer darker floors. 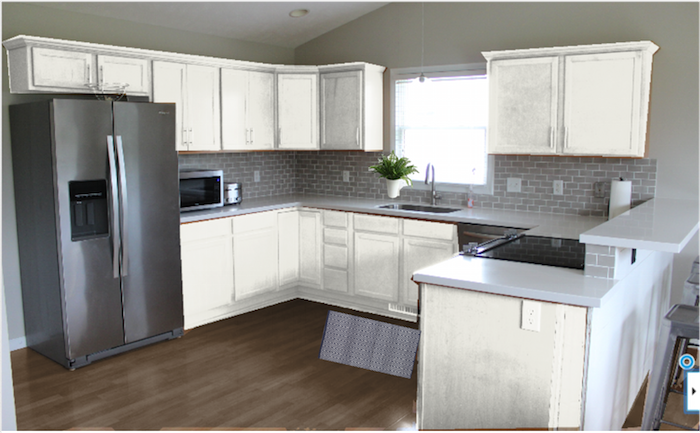 Before I knew my husband was going to let me paint the cabinets, I created this visual here to show how I wanted the whole space come together ideally. Lucky me it's actually happening!! This is the flooring that we ultimately decided on. 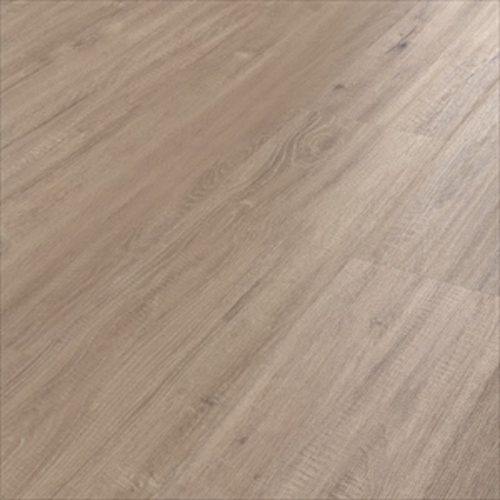 It's Karndean Loose lay Vinyl long boards in Taupe Oak. I LOVE dark flooring and will most likely have them in the entire first floor if I'm every luckily enough to build our home, but we ultimately decided on this because I know it won't show everything and it blends beautifully with our carpet and tiling in our front hallway which gives the house a more consistent look. In addition since it's vinyl (although will feels and looks very much like real wood), it means that it is completely damage and waterproof which will be very nice for in the kitchen and when we have kids. 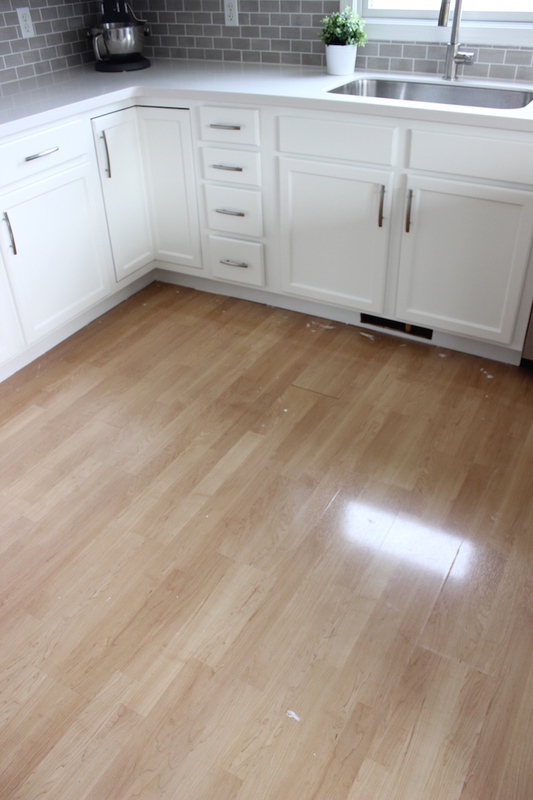 In the stock photo above, the flooring looks quite a bit lighter but here is a better indicator of how it looks in our kitchen. It definitely has a little gray in it, but compared to our backsplash and countertops it looks very brown which is exactly what I wanted. So when do we plan to do this project? Well, let's just say that the flooring is be delivered TOMORROW!!!!! For my Christmas present this year I asked my husband that everything could be completed before I have my family up for a small party on December 17th, so he's making it happen! Since this flooring cost more than the laminate I was looking at from Home Depot and Lowes, we are choosing to install it ourselves. Wish us luck! 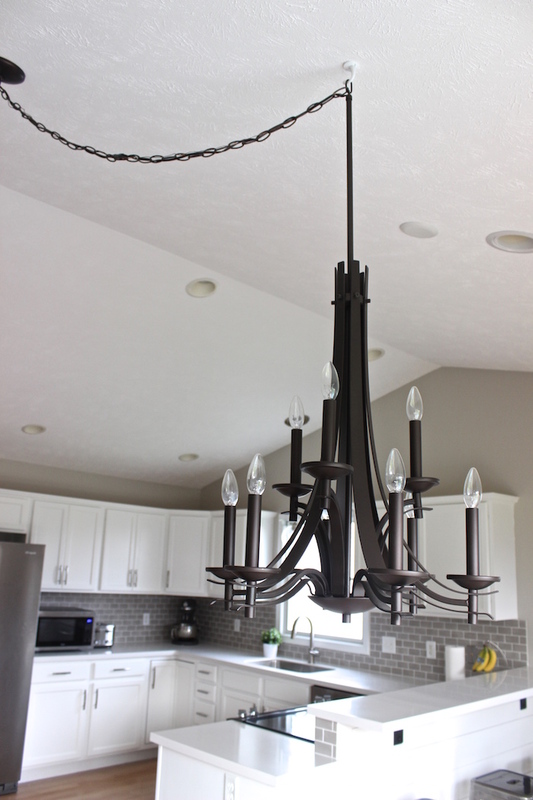 Second, we are replacing our light fixture that is hung over our kitchen table. Currently, we have a swag chandelier so we are hiring an electrician and having a new outlet put in so that it doesn't have to swag and instead can hang directly straight down from the ceiling. The current chandelier is also very off center, as you can see from photo I took last night, so we are going to have the chandelier installed to hang directly in the middle of the table and back door. 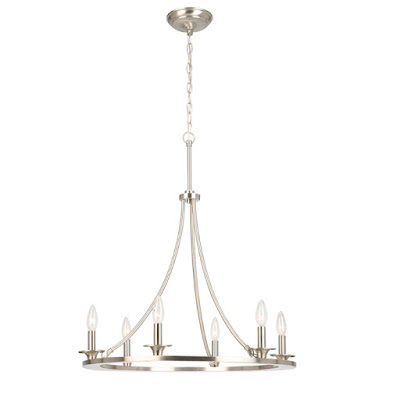 As for the new chandelier, I ultimately choose this light fixture from Lowes. 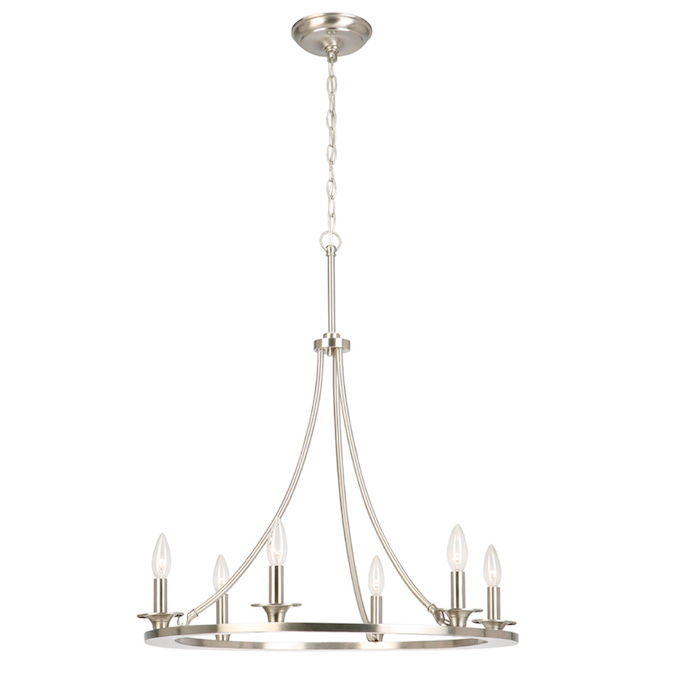 I wanted a brushed nickel fixture that didn't cost an arm and a leg and that also was more airy where you could see through to the kitchen so this fit the bill perfectly! The electrician is actually scheduled later TODAY so this will be installed very shortly as well! I can't believe how quickly this is all coming together! Stay tuned for more updates on them! Oh my gosh! This looks amazing!!! Soooooo pretty! 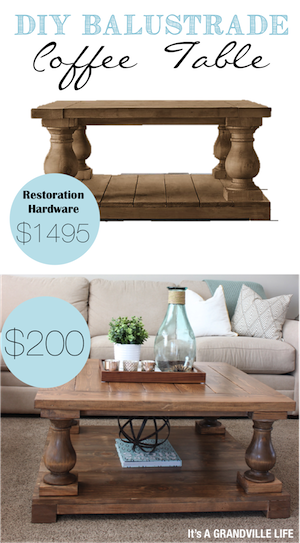 I can't wait to see the finished flooring and your new light fixture! 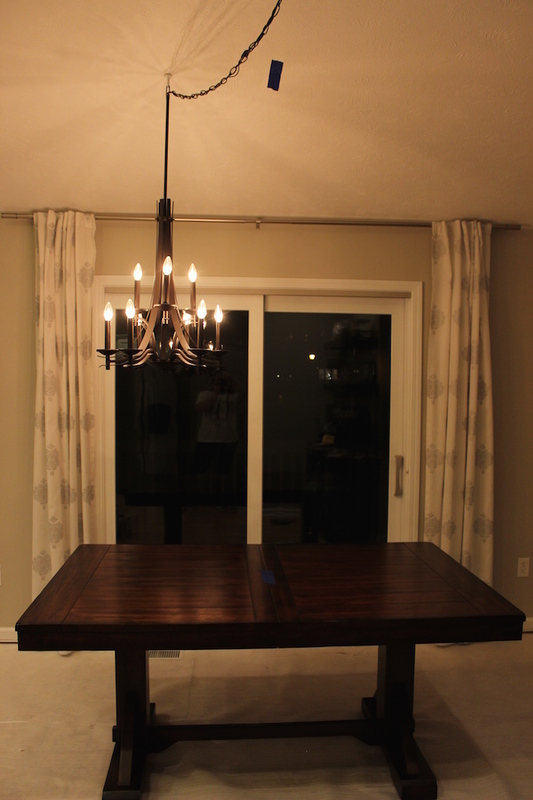 I want to move our fixture in our dining room, as well. It drives me nuts that it's off center, but I'm still trying to convince Jon that we should hire an electrician and have it moved and centered. Wish me luck with that one! Bahaha! Anyhoo, everything loooks amazing! Great job, girl! 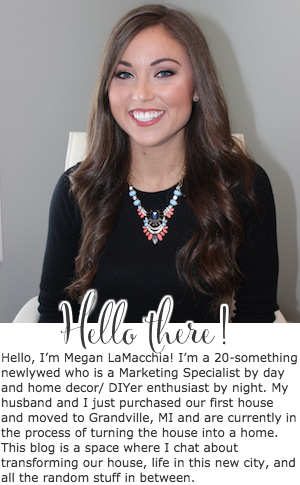 Your kitchen is so clean and beautiful :) very well decorated.